and heres one for quiqo i just started to make signatures. didnt know it was so much fun hope you like em. Those are actually really good! Nice work! What software did you use - you didn't go out and spend $900 on Photoshop did you? Ok, so here's the OMG! It's raining! Pictures I was talking about. Sadly, I had only backed up Pikachu before my hard drive failed, so I lost all of my other ones. I'm remaking them though, so they should be up soon. Tell me what you think! thanks, squirtle actually, i AM using photoshop. its illegal, so its free. what ar YOU using? you are doing a fine job too. btw, what do the respect points give? hi im back people. wow i missed heaps!!! respect points arn't really anything but they tell other members who is helpfull and who isnt. i like the raining pictures lol and the pokeball looks sleek and flat. maybe you should try on a 3d one now. Hi all! Thanks for the comments! Yeah, the actual free vector editor I used for the Pokéball doesn't have outer shadow, only inner shadow on the free version, so the Pokéball can't get a shadow through that. I will, however, edit it in Pixlr, which is like a free, online Photoshop, and I'll post it back here. The software I use for the signatures is the Pages '08 word processor from Apple, although they have released a new version now. You can check it out at: http://www.apple.com/iwork. The editor I used for the Pokéball is called DrawIt Lite, which is a free version of the more professional DrawIt software. (You can just google DrawIt Lite to find it!) For the effects on the old style bulbasaur and the OMG! It's Raining! pictures, I used a free, online photo editor, which, in my opinion, is actually better than photoshop for what I'm using it for. It's called Pixlr, and you can find it at: http://www.pixlr.com. Ok, so here's a feeble attempt to try to make the Pokéball a little more realistic. Let me know if it looks better, or worse. I just had an idea. I'll be right back. hey squirtle could you make a banner for this forum? 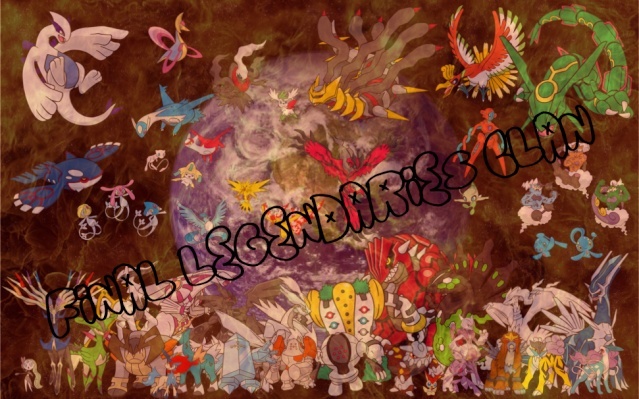 somthing with legenadries on it with writing saying Pokemon Final Legendaries Clan. Sure! (I was hoping someone would ask that! ) I'll get right on it! OK, here's a quickie version of it, but it can be changed if you guys want it to be! Let me know what you think! wow that looks awesome!!! i'll put it up top to see how it looks up there. thanks alot squirtle. thanks for the feedback, guys. im trying to make a similar signature to squirtles, i mean the forum sig, but with all the legendaries. soon. thanks, FlamingToaster! Here's another quick thing I made, 'cause I was bored... let me know what your guys think! I'm on a roll! :lol: Here's another one I made, since none of my other friends like Pokémon, so... yup. OK, this is the beginning of a set of mini-signatures, and, well, you'll just have to look at 'em! Let me know what you think! pretty nice, squirtle. ive now got 4 new ideas 4 signatures, and 2 new ideas for missions (sorry for offtopic). signatures will come soon, because my PC crashed, and i think i will have to re-install the windows... damn.. hey, squirtle. do you mind if a make a sig for you? nice work squirtle keep it up!!! Nice work squirtle. Dont mean to be disrespectful MewtwoMaster but this IS Squirtles thread for HIS signatures so is it alright if you make your own thread? Thanks, no disregards, keep up the good work both of you.